Chicago musician Nnamdi Ogbonnaya may be a familiar name to anyone who lives in Chicago or follows their music scene. 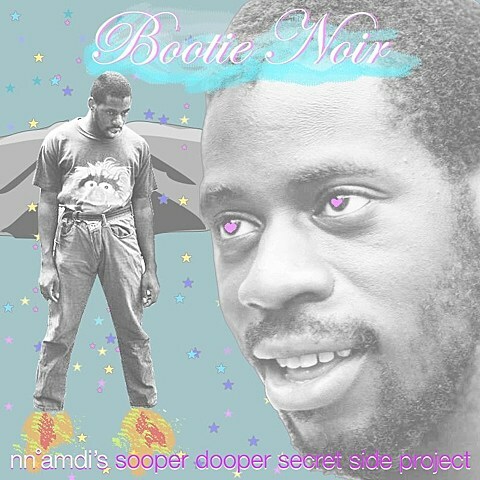 He’s a former member of My Dad, has ties to the Swerp Records collective, and also currently plays in The Para-Medics, Pisces at the Animal Fair, The Scooper Swag Project and Nervous Passenger, as well as leading his own solo project, Nnamdi’s Sooper-Dooper Secret Side Project. That project’s somewhere between avant-rap and art pop, but thanks to his ties to the indie rock scene, he’s got contributions from Maps & Atlases‘ Dave Davison, Joan of Arc/Make Believe‘s Bobby Burg, Make Believe/Birthmark’s Nate Kinsella, Peter Helmis of Algernon Cadwallader, members of Meat Wave, Johnny Foreigner and more. Those all appear on his 2013 album, Bootie Noir, which you can stream below. That album also features Ratboys singer Julia Steiner, who appears once again on “Sit Tight” off his more recent album, Feckin Weirdo. You can stream that below too, and also check out the brand new video for “Sit Tight” which premieres in this post. Speaking of Ratboys, the newly Topshelf-signed band brings their tour to NYC tonight (5/26) at Bushwick Public House (1288 Myrtle Ave). That’s $7 at the door.